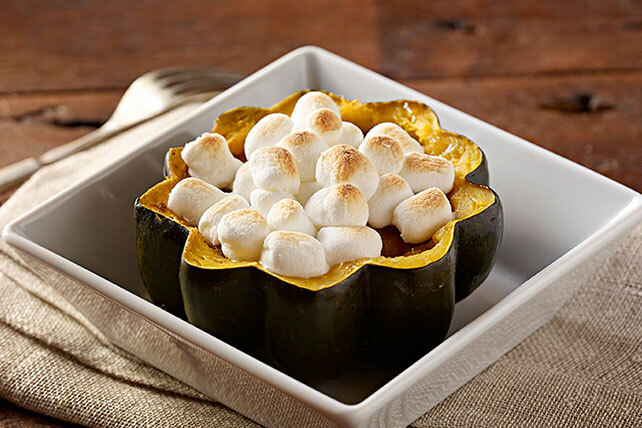 Mash acorn squash & top with brown sugar & marshmallows to baked in its own shells for a tasty side dish. This harvest time Acorn Squash is great for fall. Place squash halves in microwaveable dish; cover with waxed paper. Microwave on HIGH 12 to 14 min. or until tender, turning after 7 min. Let stand, covered, 5 min. Scoop squash from shells into medium bowl, leaving 1/4-inch-thick shells. Add butter; mash until squash is smooth and butter is completely melted. Spoon into squash shells; place on baking sheet. Sprinkle with sugar; top with marshmallows. Bake 12 to 15 min. or until squash are heated through and marshmallows are lightly browned. To bake squash in the oven instead of cooking it in the microwave, cut squash in half and remove seeds. Place squash halves, cut sides down, in 13x9-inch pan filled with 1/2 inch water. Bake in 375°F oven 40 to 50 min. or until squash is tender. Scoop squash from shells, then continue as directed. Acorn squash is a popular variety of hard-skinned squash. Choose squash that are heavy for their size. The rinds should be hard, deep colored and free of spots. Store in a cool, dark, well-ventilated place for up to 1 month.